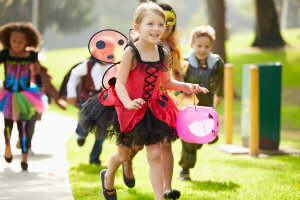 If your child has a gait abnormality don’t fear; they’ll still be able to go trick-or-treating! This time of year is filled with so much spooky fun that you won’t want your child to miss out on a moment of it. Although gait abnormalities are very common it’s still a good idea to get them checked out so that a treatment course can begin. Circumduction gait: If one of your child’s legs is shorter than the other one they may walk with excessive hip abduction. This can also be seen in children with cerebral palsy. Spastic gait: Children who have cerebral palsy may end up dragging their feet when they walk. Toe-walking gait: Although it’s normal for young children to do a fair amount of toe-walking it can be troublesome if that’s all they ever do. It can be a symptom of a neurological disorder, such as cerebral palsy. Stepping gait: If your child lifts their entire leg and brings it back down every time they take a step this is called “stepping gait”. This can be a side effect of having weak ankle dorsiflexors. Antalgic gait: When children injure themselves they may favor one foot over another. The act of putting more weight on one foot than another can result in abnormal walking patterns. As you can see, abnormal gait can range in cause and symptoms. If anything about the way your child walks is troubling you, call Dr. Peyman Elison and Dr. Viedra Elison at (623) 584-5556 to schedule an appointment with us at Fixing Feet Institute in Surprise, AZ. Your children are the most important thing to you so we want to make sure their feet stay healthy, too.